How to run third party applications on your iphone and get full access to your iphone disk? This website opens your iPhone for full disk access and installs Installer.app so that you can add any third party application you like. To use it all you need to do is point the Safari Browser on your iPod or iPhone to jailbreakme.com, once there read the instructions and scroll to the bottom, Tap and install AppSnapp. [ Iphone is not activated ? Follow the steps here to access your safari web browser ] . 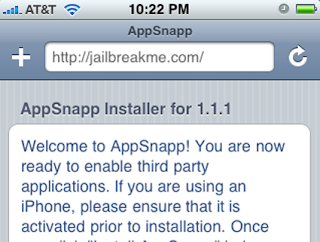 After the compltetion of this , your Safari will crash, which means that your iPhone has been successfully jailbreaked. The iPhone will reboot now , Slide to Unlock. On the home screen you will find a shiny new Installer.app icon. Tap it and install applications that you have always wanted on iPhone. What can this jailbreak website do ?? Fixes Apple’s TIFF bug, making your device MORE secure than it was without AppSnapp! Note : I'm not responsible if anything wrong occurs to your iphone after visiting this website.Data provided is just for your information .Try to do the Jailbreak over WiFi rather than EDGE, as chances of failure on WiFi is almost nil. Source : Dailyapps . Sir From Past 2 Dayz Only Public Service Ads R Been Displayed In My Blog And Ur Blog and Laso At Other Adsense Units Solid Color Is Been Displayed ... Some Prob With Google Servers ? ?